At a press conference about a month ago, the President of the ECB, Mr Mario Draghi, raised the possibility of a new round of LTRO (Long Term Refinancing Operation), which, for those less familiar with the topic, consist of large-scale, long-term, low-interest loans to commercial banks across the eurozone, which serve to increase what’s called the ‘monetary base’. While many people think and use the analogy of ‘printing more money’ as the equivalent of undertaking expansionary monetary policy, the reality is that the vast majority of money consists of deposits and is created by the banking sector through credit provision. By extending loans to customers and crediting those loans to their accounts, banks effectively create money (i.e. generally accepted means of payment); and by extending loans to commercial banks, the ECB enables the former to increase the amount of credit, hence money, made available to the economy. 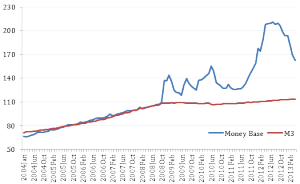 The relationship between the monetary base and the total money supply is called the ‘money multiplier’ and the standard view, widely taught to economics undergraduates around the world, is that central banks are largely able to control the total money supply, namely by expanding or contracting the monetary base. However, this ‘standard’ account of how monetary policy works is shattered to pieces by the abundant evidence provided by developments in the eurozone since the onset of the crisis. As shown in the Figure below (taken from here), between 2008 and 2012 the ECB more than doubled the eurozone’s monetary base (through such programmes as the LTRO), and, lo and behold… there was neither runaway inflation (as most delusional neoclassical economists might have expected) nor anything vaguely resembling a solution to the crisis (as some crude Keynesians might have expected). Quite simply, the enormous expansion of the monetary base did not translate into an increase in the total money supply, i.e. into more credit extended to the economy (M3 in the Figure). Source: European Central Bank, Statistical Warehouse. The reason for this, as explained by the largely-ignored Post-Keynesian school, is that banks aren’t actually constrained by the monetary base or fractional reserve requirements when it comes to extending credit: as even bankers themselves will tell you, banks neither function as mere intermediaries between depositors and borrowers, nor do they give out loans to the extent allowed for by the amount of reserve deposits that they hold with the central bank: rather, they extend loans first, credit them into their customers’ accounts and only subsequently do they deposit a fraction of that new credit with the central bank. So in the real world, banks are virtually unconstrained in their ability to create money. Unconstrained by reserve requirements and the monetary base, that is, for in reality they are constrained by other things – crucially, by the demand for credit on the part of potential borrowers, with potentially profitable investment projects, who provide sufficiently good guarantees of paying back the loans. And that’s exactly where the problem lies. In a situation where aggregate demand for goods and services in the eurozone is constrained by both a massive debt overhang and widespread austerity, many firms are unable to take out additional loans due to over-indebtedness, and the vast majority of the remainder are much less willing to undertake productive investments due to the slim prospects of getting a return on those investments. Thus the attempts on the part of the ECB to control the money supply become like pushing on a string: additional narrow money creation doesn’t actually get pumped into the economy, or only does so to a very limited extent, instead causing the banking system (or some parts of it) to accumulate excess liquidity. Indeed, the reason why the monetary base has been decreasing in the last few months (see Figure above) is that many banks across the eurozone have been paying back their own loans to the ECB so as not to hold on to liquidity for which they don’t have any use. There aren’t that many profitable productive investment opportunities around these days, and even the financing of asset-price bubbles – housing, gold, food derivatives – no longer seems as attractive as it used to. Now, to be accurate, it’s not necessarily the case that monetary policy has been entirely ineffective: it is probably true that the money supply in the eurozone would have collapsed were it not for the unprecedented expansion in the monetary base. 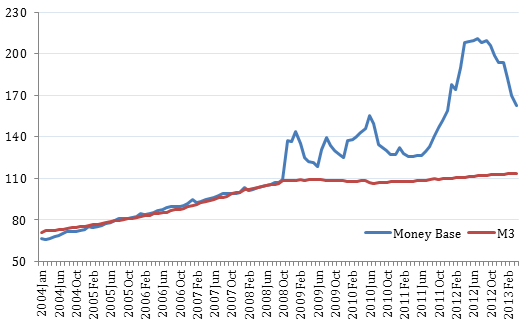 However, the complete breakdown in the stability of the money multiplier shows quite clearly that: i) money is created endogenously in the economy by banks and effectively limited by aggregate demand; ii) we’ve reached a point where narrow money creation is neither inflationary nor expansionary – it’s largely ineffective; and iii) the root cause of the problem is stalled aggregate demand across the eurozone as a whole, owing to rising inequality and over-indebtedness built up over the course of the last 2-3 decades and only made worse by austerity. So whether or not a new round of LTRO is indeed implemented won’t really make much of a difference, at least for the purpose of reviving the eurozone economy and overcoming the crisis. Want some really ‘structural reform’? Reconnect fiscal and monetary policy, so that the latter is backed up by sufficient stimulus to aggregate demand, and actively promote 5%-6% inflation, so that the debt overhang can be gradually overcome. Of course, the chances of this occurring without major political and institutional overhaul are, well, zero – as are the chances of overcoming the eurozone crisis in the next few years. Dr Alexandre Abreu is a 33-year-old Portuguese economist with a PhD from the University of London. Currently he is a lecturer in Development Economics at the Institute of Economics and Business Administration, Technical University of Lisbon, and a Researcher at the Centre for African and Development Studies of the same University. Are we Living in a Post-EU Society? « Euro on Will France Become like the Netherlands or the Netherlands like France? Do the German elections matter? « Euro on Is there an Alternative for Europe in Germany? Euro based on WordPress MU hosted on boellblog.org. Subscribe: Posts (RSS) und Comments (RSS).